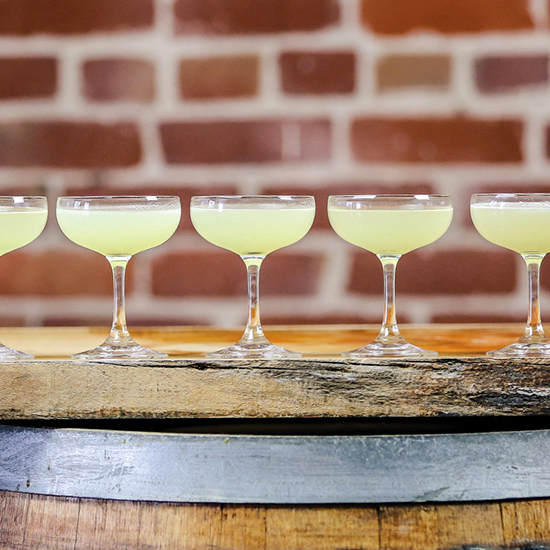 From pint-sized “Snaquiris” to the #DTO (that’s a Daiquiri Time Out), the Daiquiri is feeling itself right now. So what’s the best way to make one these days? That’s a question that Jason Kosmas pondered before commissioning Caña Brava rum, one of the brands from 86 Company, which he co-founded with Dushan Zaric (both are also co-founders of NYC speakeasy Employees Only) and Simon Ford. If you haven’t tried the rum before, it’s a light, nearly neutral rum. It has a faint golden tint and just enough marshmallow, ginger and lime zest notes on the clean, brisk finish to keep things interesting. In other words, it’s an ideal rum for Daiquiris—and that’s no accident. “We asked bartenders if they could create a premium well rum, what would they look for?” Kosmas recalls. Most pointed to what’s called “carta blanca”—a Cuban-style white rum—that mixes well in drinks like Mojitos and of course, Daiquiris. Next was a visit to London’s Savoy Hotel, which keeps a library of old and rare liquor bottlings. There, Kosmas gauged what a Daiquiri—and the rum used to make it—would have tasted like around the turn of the last century. According to some accounts, the Daiquiri was created by Jennings Cox, an American mining engineer who was in Cuba at the time of the Spanish–American War (1898); another origin story places the drink’s creation a couple years later, but still ties it back to Cuba. Clearly, Cuban-style rum was the correct answer. And the best man to make that rum, Kosmas decided, was Francisco “Don Pancho” Fernandez. One of the famed Maestros Roneros (“rum masters”) who worked with Havana Club in Cuba, Fernandez moved to Panama in the 1990s, where he still resides and makes rum today. (He’s also produced his own line of luscious Origenes Reserve aged rums, which are well-worth seeking out). Don Pancho provided valuable guidance. “For a long time, spirits producers have been trying to turn rum into the next vodka,” Kosmas notes. “Don Pancho, he’s like, ‘Rum is rum. Forget about vodka. Let it be rum, and let it be cherished and enjoyed for what it is.’” After selecting barrels and blending the three-year-old rum, it was time to run the product past the bartenders one more time. “The feedback we got is that it was beautiful out of the bottle, but it didn’t pop in a Daiquiri. So we raised the proof [from 80-percent ABV] to 86-percent,” a move calculated to add not just alcohol but flavor. In a cocktail shaker, combine all ingredients with large ice cubes. Shake vigorously and strain into a coupe glass. Kosmas prefers to skip the garnish, but if it looks too austere, float a thinly sliced lime wheel on top of the drink.